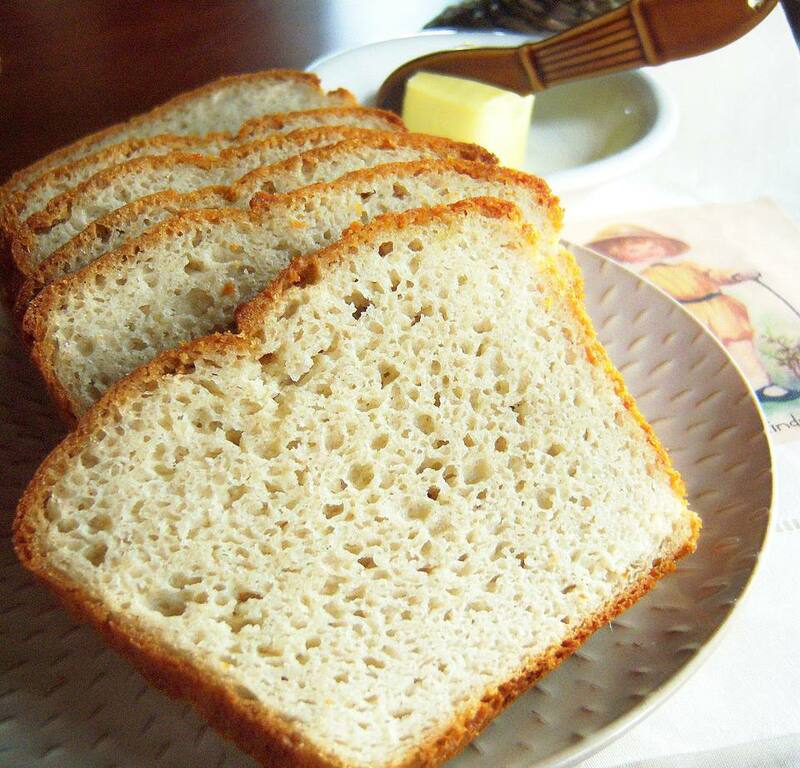 This gluten-free bread has a terrific springiness and is neither too dry or too wet. And, it has a wonderful yeasty flavor and calls for simple ingredients that are easy to find. When followed exactly this recipe is consistently dependable. The batter rises quickly and as the loaf bakes, it doesn't bubble over the sides of the pan. As it cools it doesn't cave in. It's highly recommended that you use a good kitchen scale to weigh ingredients, don't substitute with other gluten-free ingredients and use an instant read digital thermometer to know when your bread is done. And if you have a good stand mixer that helps too. Also, an optional ingredient called for is "apple fiber." Most health food markets and lots of online stores carry this inexpensive nutritional supplement which contains about 10% apple pectin. Apple pectin adds texture and flavor to bread recipes, even though a small amount is used. Place a 2-quart bowl on a kitchen scale. Weigh each dry ingredient into the bowl. Be sure to press the "zero" feature on your scale before weighing each ingredient. Use a whisk to thoroughly blend dry ingredients. Place room temperature egg whites in mixing a bowl of stand mixer. Use paddle attachment and beat on high for 1 minute. Eggs will be frothy. Add olive oil and apple cider vinegar and beat to blend. At this point, preheat oven to 375° F / 190° C. Use a thin plastic "spreader" spatula to scrape the thick bread batter into prepared 8 X 4-inch loaf pan. Hold the spatula upright and insert it into batter throughout to break up any air pockets in the batter. Dip spatula in some water and use it to shape a nice smooth loaf. Run the spatula down the sides and over the top of the loaf until it's nice and smooth. Cover the batter loosely with plastic wrap and set the pan in a warm, draft-free location to rise. This takes about 30-45 minutes. The loaf should rise just above the top edge of your pan. Place pan in preheated oven. Bake for about 30 minutes, or until deep golden brown. Tent loosely with foil. Bake for another 30 minutes or until an instant-read digital thermometer reads 208° F / 97.8° C. This is an important step and will ensure that your bread is completely cooked. Use your thin spreader spatula or a knife to release loaf from pan immediately after removing it from the oven. Cool on a wire rack. When completely cool slice bread.